Hugo Teso works as Head of Aviation Cyber Security Services, F-Secure Corporation. He has been working on IT security for the last 16 years, mainly in Spain. Also being a commercial pilot, it was just a matter of time before he focused his attention on aviation security. 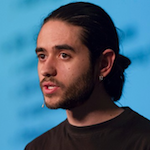 Together with the development of some open source projects, like Inguma and Bokken, he has spent a lot of time on aviation security research and has presented some of the results in conferences like RootedCon.